Mia's Tieback Top, Dress & Maxi. PDF sewing pattern for toddler girl sizes 2t - 12. If you have lots of fabric scraps, this pattern is for you! With the tiered skirt option, you can use different fabrics for each tier (or even use two fabrics on a single tier!). 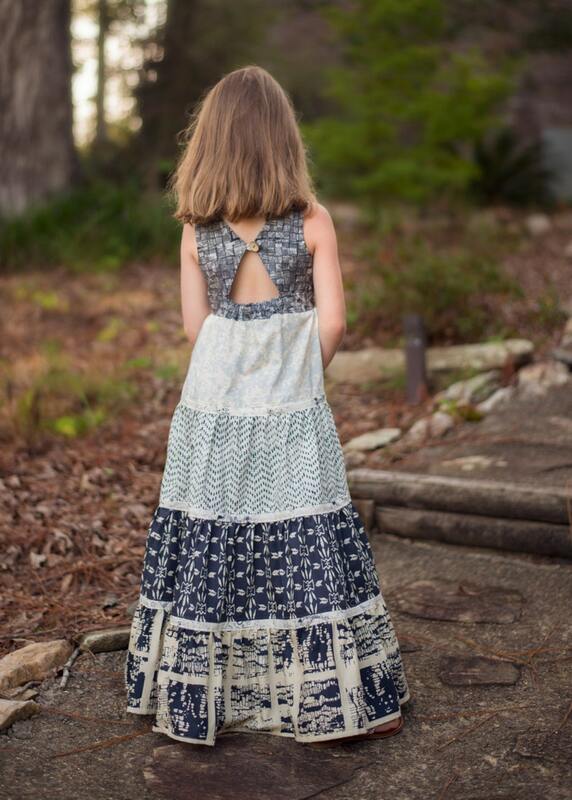 If you like a simple style skirt, that is an option included in this pattern as well! Two triangle panels that tie in the middle of the back make this dress swoon worthy! Perfect year round with all the options! BUNDLE: Megan's Wrap Top & Dress AND Mia's Tieback Top, Dress and Maxi. PDF sewing pattern for toddler girl sizes 2t - 12. Megan's Wrap Top & Dress. PDF sewing pattern for toddler girl sizes 2t - 12. My daughter looks lovely in the dress! The only reason I don't give this 5 stars is that 1) the bodice is a bit short, and 2) the pattern calls for straps that I didn't see anywhere when cutting out the pattern. I figured out the size of the straps on my own. I made a sash for the dress, which gives it a more polished look than the elastic. Cora's Wave pleat bodice Top, Dress & Maxi. PDF sewing pattern for toddler girl sizes 2t - 12.